(0-175 /0-12 bar ) are required. Five-lobe, 20cc/rev. displacement rotors combine superior metering repeatability with reduced pulsation and quiet operation. Rotor case geometry maintains volumetric efficiency, while chamfered cusps around the ports enable self-draining for enhanced CIP/SIP. Front-loading seals provide ease of maintenance, with flush rotor retainers for enhanced CIP/SIP. Unique one-piece rotor case provides superior concentricity, contributing to longer seal and bearing life, in a smaller footprint. Non-contacting lobes may run dry with seal flush. Reversible direction of flow allows use of one pump for filling or draining. Single mechanical seal, SiC faces, FDA EPDM elastomers. (Standard). ¾” sanitary clamp connections (5/8” bore) with vertical ports. (Standard). Drop-in face-mount flange interchangeable with common pumps. NEMA 143/145TC motor mount with integral 3:1 gear reduction. IEC Frame 80 motor mount with integral 3:1 gear reduction. ¾” sanitary clamp (5/8” bore), horizontal ports. ½”sanitary clamp (3/8” bore), vertical or horizontal. ¾” weld neck (5/8” bore), vertical or horizontal. ½” weld neck (3/8” bore), vertical or horizontal. 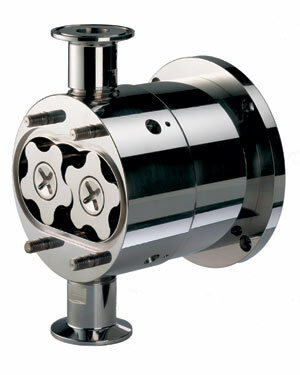 Pumps conform to 3A standards. Certified according to EHEDG method for in-place cleanability.